Some characteristics of this class: It’s size and the thickness of the rings adapt dynamically to the container. The rings can start and end at any angle. 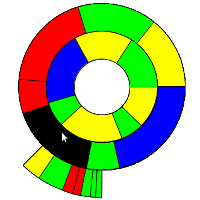 The segments of each ring are divided proportionally based on the segments value and drawn to the proper arc length based on the start and end angle. You can download the sources at OpenProcessing, what follows is a description of the classes ArcSegment, Ring and RingChart.